Few pedals are as Gilmourish as the legendary Big Muff. Itâ€™s been featured on some of Davidâ€™s best performances including perhaps the greatest solo of all time â€“ Comfortably Numb. In this feature weâ€™ll look at the different models employed on the albums and tours. The Big Muff was designed by Electro Harmonix founder Mike Matthews in the late 60s. The first years of production saw the pedal in various shapes and forms, both under the Electro Harmonix banner and other brands as well. As talked about in the Big Muff â€“ Tone Tutorial feature, the early so-called Triangle and Ramâ€™s Head (named by the alignment of the knobs) circuits was often hard to tell apart and few pedals sounded identical. You could very well end up with a Ramâ€™s Head that sounded closer to a Triangle and vice versa. It seems that Electro Harmonix would use whatever parts they had available as long as they sounded somewhat similar. A nightmare for the avid collector but itâ€™s perhaps this very inconsistency that made the Big Muff so special. Phil Taylor (Davidâ€™s backline technician since 1974), introduced David to the Big Muff in the mid 70s. Taylor had been hired during the summer rehearsals in 1974 and one of his main jobs (which continues to this day) was to upgrade Davidâ€™s rig. They bought new Hiwatts, WEM cabs and lap steels and it was also around this time that David started to collect both pedals and rare guitars. Taylor explains: â€œI introduced David to the Electro Harmonix Big Muff Pi in 1974. He liked it, and he has continued to use one ever since. David has tried many of the different incarnations and models over the years, but his original has often been preferred for most things.â€œ â€“ Phil Taylor, Guitar Player January 2009. David might have gotten his first Big Muff in 1974 but it was not employed until the recording of Animals in 1976. Personally I think 1974 is a bit too early and a theory could be that he got the pedal(s) in 1975 during the US-leg of the Dark Side of the Moon tour or possibly later. In early 1976, David and Phil, comissioned a custom pedal board from Pete Cornish, that would feature both new items and some that had been in Davidâ€™s setup since the late 60s. See this in depth guide to the Animals/Wall Pete Cornish pedal board. See the David Gilmour Gear Guide for full setups on all Pink Floyd and solo albums and individual songs. 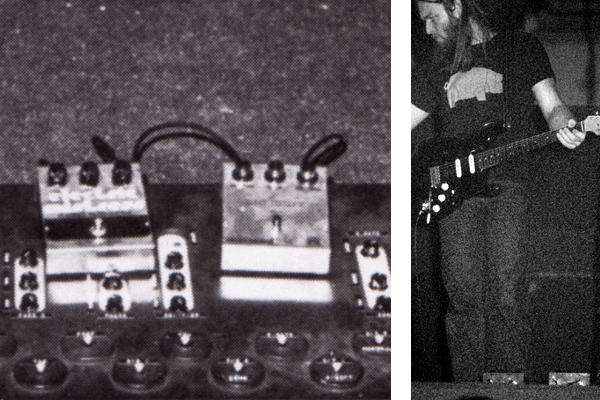 #1 â€œramâ€™s headâ€ â€“ David acquired the pedal sometime between 1974-76. The pedal has been featured on possibly every Floyd/Gilmour album since Animals but never used on a tour. Based on comments from Phil Taylor and Pete Cornish, it is likely that all of Davidâ€™s Muffs, the ones featured in the Cornish boards and stand-alone pedals, has been modified to sound like this pedal. 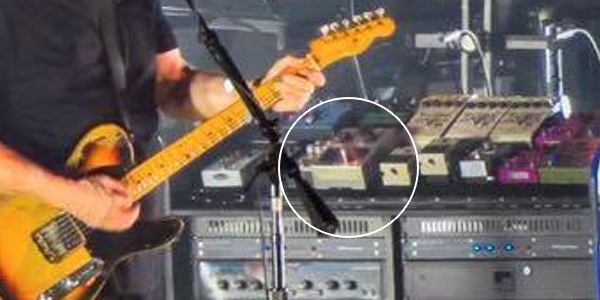 #2 â€œramâ€™s headâ€ â€“ This seems to have been David’s main touring pedal, not counting the circuits built into the Pete Cornish boards. The pedal can be recognised by custom fitted Fuzz Face-like knobs (due to new round potentiometers) and a screw on the front of the chassis, mounting a custom buffer inside the pedal. The pedal has possibly been modified by Pete Cornish to sound like David’s #1 Big Muff. The #2 is first seen lying on top of David’s Pete Cornish Animals touring board during the 1976 rehearsals and the following tour in 1977. It was again featured in the 1984 About Face stage rig and the 1989-90 leg of the Momentary Lapse of Reason tour. The pedal was also used during the rehearsals at Bray Studios, London UK, in May 2006 but replaced by a triangle model, which was used for the remainder of the On an Island tour. The #2 Ram’s Head Big Muff is also featured in David Gilmour’s 2015/16 Rattle That Lock stage rig. The pedal was used on several numbers, including Comfortably Numb and early performances of Sorrow. The Pete Cornish Animals touring board. An Electric Mistress flanger and a ram's head Big Muff was added for the tour and later featured in the board circuit after the tour. The Big Muff is David's #2 used for most tours and recordings throughout the years. David Gilmour’s #2 Ram’s Head Big Muff is featured in the 2015/16 Rattle That Lock stage rig. The Pete Cornish 1976 Animals studio/stage board originally featured a Cornish P1. As noted above, the #2 Big Muff was lying ontop of the board paired with an Electric Mistress, throughout the tour. The board was modified after the tour, in October 1977, and according to Pete Cornish he replaced the P1 with a new â€œramâ€™s headâ€ circuit (most likely modified to sound like #1) and he also built in an Electric Mistress cirquit, removing the two stand alone pedals (Guitar World 2006). The board was later used for Davidâ€™s 1978 solo album and Wall 1980-81 tour. See this in depth feature about the Pete Cornish Animals board. The Pete Cornish 1979 Wall studio board featured a â€œramâ€™s headâ€ Big muff. The circuit was most likely modified to sound like Davidâ€™s #1 â€œramâ€™s headâ€. The board was later used for the About Face and Division Bell recording sessions and possibly also The Final Cut sessions â€“ David at least used a Big Muff on the sessions. The Pete Cornish 1980 mini front stage Wall board features a â€œramâ€™s headâ€ Big Muff. The circuit was most likely modified to sound like Davidâ€™s #1 â€œramâ€™s headâ€. The Pete Cornish 1999 All Tubes MkI board features a â€œramâ€™s headâ€ Big Muff. The circuit was most likely modified to sound like Davidâ€™s #1 â€œramâ€™s headâ€ (it might have been required for the construction of the board or Cornish used a circuit from one of the earlier boards). The board was used for the 2001/02 semi-acoustic shows, On an Island studio sessions, Live 8 and on several guest appearances between 1999-2012. It was also used as a back up board on the 2006 On an Island tour. Note the #2 ram's head Big Muff on the floor to the left in David's Astoria houseboat recording studio. 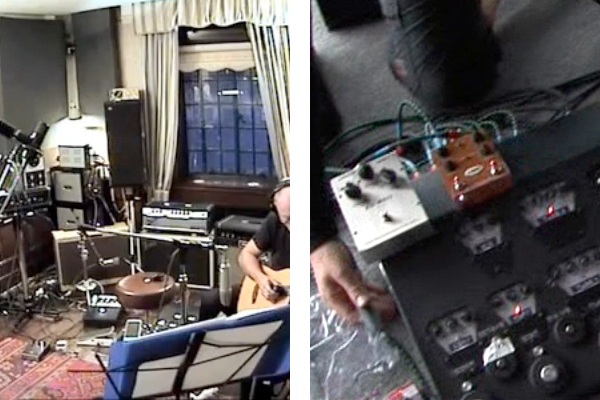 The picture on the right shows David's Pete Cornish All Tubes MKII 2006 touring board with the additional Electro Harmonix triangle and TRex Replica echo. David probably own several so-called â€œtriangleâ€ Big Muffs but there are no reports on him using one during the Floyd days. However, one is seen on top of the Pete Cornish 2006 All Tubes MkII pedal board during the last leg of the On an Island tour, between May and August 2006. The pedal was connected via send/return looped with a T-Rex Replica echo â€“ possibly used for Echoes where both pedals needed to be engaged simultaneously. Originally called â€œCustom Fuzzâ€ the P1 is loosely based on one of the many Big Muffs David presented to Cornish in late 1975 or early 1976. It was featured in the Animals session/stage board from January 1976 to October 1977 when it was replaced by a â€œramâ€™s headâ€ circuit. It is not documented whether David actually used the P1 or perhaps the #1 â€œramâ€™s headâ€ for the recording sessions â€“ possibly both. It is also not known why David chose to have both the P1 and the #2 â€œramâ€™s headâ€ (on top of the stage board) on the tour. He might have used both perhaps with different settings (one with high gain settings and one slight milder in a combo with the Colorsound Powerboost). The Pete Cornish 2006 All Tubes MkII On an Island touring board features a P1 â€“ most likely a new circuit. Originally called â€œPrecision Fuzzâ€ the P2 was introduced around 1988 as an upgrade of the P1. The P2 is first seen in Davidâ€™s 1989 Momentary Lapse of Reason stage rig after it replaced the #2 â€œramâ€™s headâ€ Big Muff. It was also featured in the 1994 PULSE stage rig labeled â€œBig Muffâ€. Considering the small size of this early version itâ€™s likely that it didnâ€™t feature Cornishâ€™s buffers. The G2 isnâ€™t really a Big Muff but one of Cornishâ€™s more unique circuits â€“ although it has obvious similarities to both the germanium Fuzz Face and early RAT models. The pedal was originally introduced around 1992 but wasnâ€™t featured in Davidâ€™s rig until the 1999 Pete Cornish All Tubes MkI pedal board. The board was used on the 2001/02 semi-acoustic shows, 2005 Live 8 and 2005/06 On an Island recording sessions as well as several guest appearances between 1999-2012. The G2 was also featured in Davidâ€™s 2006 Pete Cornish All Tubes MkII On an Island touring board and used for many of the performed songs. David is seen using this early Sovtek model during the 1993 Division Bell recording sessions. Itâ€™s not documented whether it was actually used for the album or not or if he perhaps employed one of the â€œramâ€™s headâ€ models â€“ or both. The pedal was again featured in the 1994 stage rig as Davidâ€™s main distortion pedal for the tour. The Sovtek “Civil War” was once again featured in David’s stage rig during the second leg of his Rattle That Lock tour in December 2015 in South America. The pedal was used in addition to the #2 Ram’s Head Big Muff and most likely used for performing Sorrow. Picture to the left shows David's early 1987-88 Momentary Lapse of Reason touring rig. Notice the #2 Big Muff featured in the setup. To the right is the Sovtek "Civil War" Big Muff Pi, David's main distortion unit for the 1994 Division Bell tour. 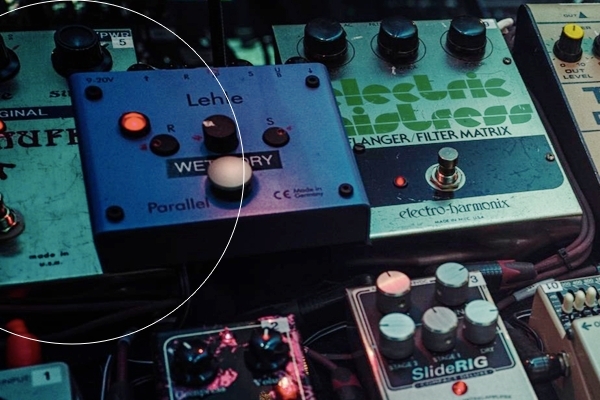 For the South American shows in December 2015, David once again used the early 90s Sovtek Civil War Big Muff. The pedal was possibly used for Sorrow. Davidâ€™s Big Muff tone has changed a lot over the years since he first used during the recording of Animals in 1976. Different amp setups, pickups and recording techniques are employed to get the tones needed for the specific song or album as a whole. The guitars were recorded with a wide range of microphones but the main source would often be a Shure SM57 placed slightly off center and 8-20 inches away from the cabinet. The slightest variation could create a whole different tone. Recording a Big Muff can be tricky and setting the amp up for that powerful, warm tube tone is essential to avoid harsh overtones. Animals, Davidâ€™s first solo album, The Wall and Final Cut were all recorded with a setup consisting of a 100w Hiwatt head with a WEM 4×12 speaker cabinet and a Yamaha RA200 rotating speaker cabinet. The signal from Davidâ€™s pedal board or stand alone pedals would be split into these two amps and the Yamaha would often be mixed slightly lower for a mild, chorusy effect. This would also be Davidâ€™s stage setup for the era. Animals is interesting because on most of the lead parts the Yamaha is almost left completely out of the mix. However, for some solos, like the ones in the verse sections on Dogs, the Yamahas are mixed quite high â€“ almost leaving out the dry signal from the Hiwatts. Most of The Wall would also be mixed this way â€“ either dry or with the Yamahas mixed high in the mix. A crucial element to The Wall is also all the studio trickery thatâ€™s added in the mix and mastering. Davidâ€™s guitars are often very compressed and gated, creating an impressive presence and punch. These tones would be almost impossible to recreate on stage. Davidâ€™s first solo album and Final Cut are perhaps the most honest recordings. It sounds like the mics have been placed further away from the speakers allowing a natural ambience for the Hiwatt and Yamaha. This perfect blend of the two adds a warm, liquidy flavour to the Big Muff, rolling off any harsh overtones and bringing out all the subtle nuances in Davidâ€™s playing. On an Island is recorded in very much the same way although this time, David would use a much simpler setup with just the Big Muff plugged straight into the amp. 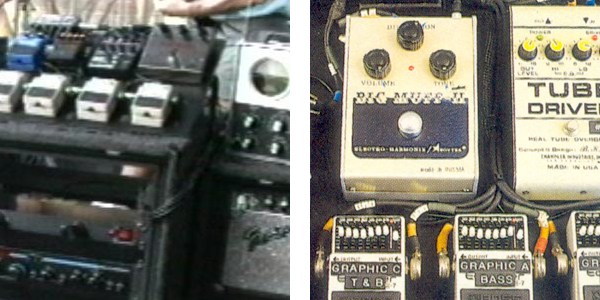 On tour, David often uses the Big Muff in combination with a booster/overdrive. This is not so much for boosting the volume but more like using an EQ. Although Davidâ€™s preferred boosters, Colorsound Powerboost and Tube Driver, are very transparent, they have more character and balls than an EQ. The Muff is set fairly mild and the booster is set up for a slight volume boost at the very edge of breakup. The result is a much smoother Big Muff tone with a natural, dynamic attack and compression. This combo with the powerful Hiwatts is the essence of Davidâ€™s live tones between 1977 to present. Using a booster while recording is not a good idea because itâ€™s often hard to tame both the increased gain and the noise caused by blending two gain effects. To get that same smooth, compressed Big Muff tone, David would play incredibly loud to get the ampâ€™s tubes really hot. This was something he also would do to smooth out the even harsher fuzz pedals in the early 70s during the recording of Meddle and Dark Side of the Moon. As described above, mic placement and additional compression, limiting and EQ is also crucial to manipulate the tone. A big thanks to Big Muff guru Kit Rae for help and research. Check out The Big Muff Pi site for more info on each model.